Abstract The benthic community of Tubbataha Reefs is dominated by hard corals that were severely impacted by the 1998 bleaching event and by lack of protection before 1992. The bleaching episode caused major changes in community structure. In this paper, we provide details of the changes of benthic composition of selected sites in Tubbataha Reefs from 1984 to 2004. Our results show that coral bleaching and the post-bleaching responses of reefs can vary spatially within a small reef system such as Tubbataha Reefs. 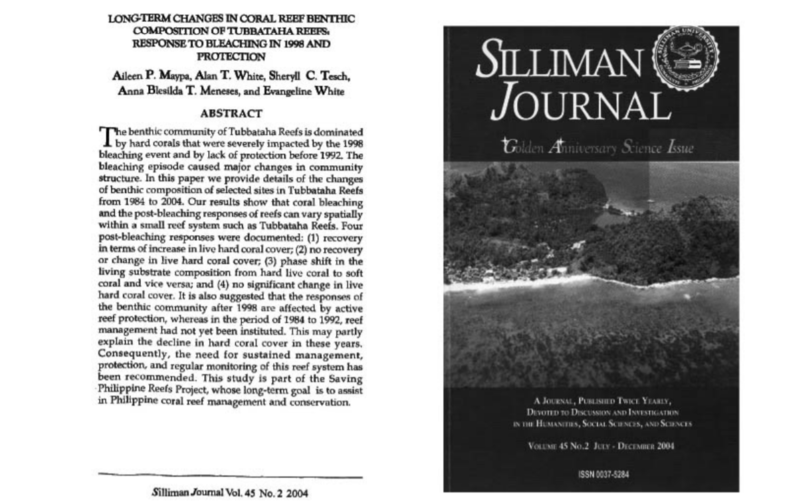 Four post-bleaching responses were documented: (1) recovery in terms of increase in live hard coral cover; (2) no recovery or change in live hard coral cover; (3) phase shift in the living substrate composition from hard live coral to soft coral and vice-versa; and (4) no significant change in live hard coral cover. It is also suggested that the responses of the benthic community after 1998 are affected by active reef protection, whereas in the period of 1984 to 1992, reef management has not yet been instituted. This may partly explain the decline in hard coral cover in these years. Consequently, the need for sustained management, protection, and regular monitoring of this reef system has been recommended, This study is part of the Saving Philippines Reefs Project, whose long-term goal is to assist in Philippine coral reef management and conservation.